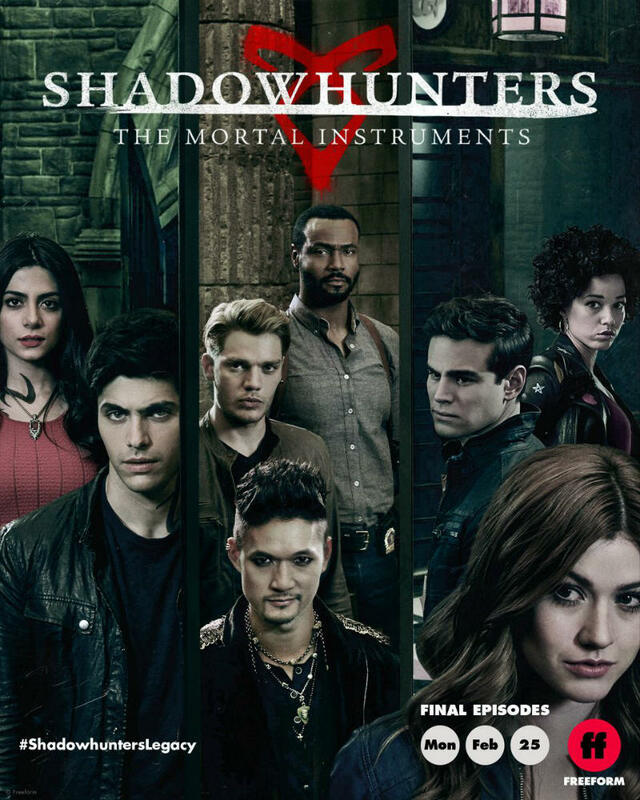 The Shadowhunters 3B poster offers very little for fans who are anxiously awaiting any and all new looks at the final chapter of the beloved series. Here are visuals we want to see! Can we catch a break? Fans of Shadowhunters have had a rough 2018, and that trend seems to be continuing into 2019 with the first look at the 3B poster. We could try to read into it a bit — pick apart the pairings, the three backdrops, the choice to have Clary overlaying two panels — but there’s really nothing there. Take a look for yourself. Instead of harping on the lackluster marketing efforts, let’s focus on what we have in store for Shadowhunters 3B. I’ve written previously about what I am personally looking forward to seeing (or hope to see) in the new season. There are lots of conversations that need to happen, battles that need to be fought, and reunions that cannot be avoided. A lot of legwork needs to be done in the character department. But there is no denying that the visual elements in Shadowhunters reached a new level in 3A. The set decorations, the Owl costuming, and the visual effects that went into opening portals, traveling to Edom and back again, and destroying the top floors of a skyscraper were all highlights of the first half of the season. The Shadowhunters world benefits immensely from the efforts of the design teams. They elevate the story told on the page. If you’re rewatching the series ahead of the 3B premiere, take a moment to look around at Hunter’s Moon, Magnus and Alec’s apartment, and the Institute. The details will astound you. Here are a few of the more visual elements I’m looking forward to seeing for the first time, and visiting one last time, as Shadowhunters 3B kicks off. Magnus and Alec’s apartment: Now that Magnus is spending a good deal of time without his powers, it will be interesting to see how that changes his living quarters. Will he keep all the reminders of his past (outside of his relationship box of course)? New corners of the Institute: Alec being in charge of the New York Institute has its perks for those close to him, but also for the viewers. Will we see a few more rooms, departments, or training areas before the finale? Siberia: Now we know Kat McNamara was joking when she said “Welcome to Siberia” in the Shadowhunters teasers, but catching up with Clary in a beautiful snowscape? Sign us up! Paris: The cast and crew headed to Paris to film a few scenes for the back end of the season. Instead of turning a Canadian location into Paris, we are actually going to get real shots of the city! Plus some of Clary’s disguises are going to make their debuts in the city of lights. The Mark of Cain: Simon is still not quite sure what the mark does. While he may be suffering under the weight of this curse, the visual of watching its power is not lost on us. Demons and werewolves: The hunt for Clary is on, but that doesn’t mean that Luke’s pack or the day-to-day job of the Shadowhunters disappears. The demons in 3A, especially any and all created and controlled by Lilith, were some of the best of the series. I hope we get to see a few more demons and werewolf transformations in 3B. The Halloween decorations: There is going to be a Halloween episode in 3B and I do not doubt that the props department and set decorators held anything back. I can’t wait to see what they came up with for this episode. Seelie Realm and the Seelie Queen: Though typically shot and edited with very dark, blue lighting, the Seelie Realm is beautiful and the costuming and makeup are always gorgeous. Simon is literally bound to visit a few more times and we’re going to see another incarnation of the adult Queen this season with Kimberly-Sue Murray stepping into the role. Trips to the Seelie Court always unearth some secrets and I cannot wait to see what Murray brings to the role in 3B. Just look at makeup artist Brian Hiu’s work!! What scenes, places, or designs are you looking forward to seeing in Shadowhunters 3B? Shadowhunters 3B premieres February 25 on Freeform. You can stream past episodes on Hulu.